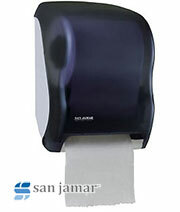 Bradley Hand Dryers are a great alternative to Paper Towel Dispensers in Commercial Facility Restrooms and Bathrooms. Warm air hand dryers provide a hygenic method for commercial restroom patrons while reducing wasteful usage of paper products and paper dispensers. If you have any questions about the Bradley Hand Dryers or any other brand we offer, please feel free to call us at 1-800-440-5556. 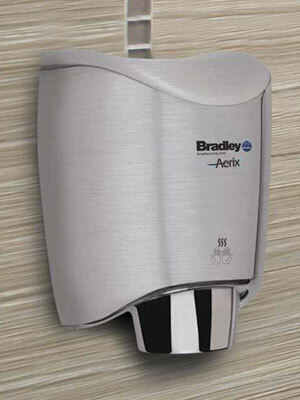 Bradley's complete line of Aerix hand dryers cover any application or budget. These dryers reduce paper towel and energy costs, protect the environment, keep noise levels down and are easy to use and maintain. NEW Aerix+ dryers incorporate the latest technology for the fastest drying times available. And the vertical, dual-sided dryer has an easy-to-empty water collection tray to keep floors and walls clean. These highly efficient, ultra high speed hand dryers use 40% less energy and offers the longest service life of any high speed hand dryer. Plus, flexible controls let you customize air flow, sound quality and heating options to fit any application. 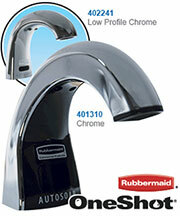 The cover and internal airflow path are protected with anti-microbial SteriTouch® technology. This dryer is also very energy efficient and GreenSpec listed. It is covered by a 5 year manufacturer's warranty. Dry time is reported at 10-12 seconds. Noise level rated at 68-75dB depending on airspeed setting. Safety features include thermal protection on heating element and motor with anti-vandalism auto-shut off and auto-reset after 30 seconds of continuous use. Tamper proof cover screws. IP24 Ingress protection rating (withstands low pressure water sprayed from all directions). cULus approved. ¹ Controls are located inside the cover and protected against unauthorized tampering (cover can only be opened with provided special security wrench). Motor Long-life universal brush type. Adjustable speed. Shipping Dimensions Approx. 15" x 13" x 11"
See how you can achieve 95% percent cost savings and 70% carbon footprint reduction by getting rid of paper towels and switching to our high-speed, energy-efficient hand dryers. 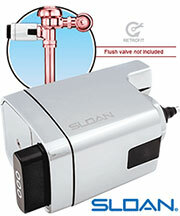 Hand dryers prove to be the leader in efficient and hygienic methods of drying. In addition, they are the most cost efficient and environmentally sound drying technique. Whether Hand Dryers are installed in schools, restaurants, shopping centers, hospitals, service stations, stadiums, movie theaters, correctional facilities, factories, hotels, health clubs, etc., each individual who uses our hand dryers is guaranteed safety and satisfaction. We are confident that you will agree that warm air hand dryers are clearly the best alternative in drying.